Sumi Madhi, a volunteer on child feeding, nutrition and care interacts with mothers in Kudada, India. Kicking off World Breastfeeding Week, the United Nations today stressed that although breastfeeding has cognitive and health benefits for infants and mothers, investment shortcomings impede the practice. “Breastfeeding gives babies the best possible start in life,” said Tedros Adhanom Ghebreyesus, Director-General of the World Health Organization (WHO). He added that breastmilk works like a baby's first vaccine, protecting infants from potentially deadly diseases and giving them all the nourishment they need to survive and thrive. The Global Breastfeeding Scorecard, a new report by the UN Children's Fund (UNICEF) and WHO in collaboration with the Global Breastfeeding Collective – an initiative launched today that aims to increase global breastfeeding rates – points out that breastfeeding not only helps prevent diarrhoea and pneumonia, two major causes of death in infants, it also helps reduce mothers' risk of ovarian and breast cancer, two leading causes of death among women. Yet, the scorecard, which evaluated 194 nations, reveals that no country in the world fully meets recommended breastfeeding standards. It found that only 40 per cent of children younger than six months are given nothing but breastmilk and only 23 countries have exclusive breastfeeding rates above 60 per cent. The scorecard was released at the start of World Breastfeeding Week alongside a new analysis, Nurturing the Health and Wealth of Nations: The Investment Case for Breastfeeding, demonstrating that an annual investment of only $4.70 per newborn is required to increase the global rate of exclusive breastfeeding among children under six months to 50 per cent by 2025. The analysis suggests that meeting this target could save the lives of 520,000 children under the age of five and potentially generate $300 billion in economic gains over 10 years, as a result of reduced illness and health care costs and increased productivity. The investment case shows that in five of the world's largest emerging economies, namely China, India, Indonesia, Mexico and Nigeria, the lack of investment in breastfeeding has resulted in an estimated 236,000 child deaths per year and $119 billion in economic losses. Globally, investment in breastfeeding is far too low. Each year, governments in lower- and middle-income countries spend approximately $250 million on breastfeeding promotion – donors provide only an additional $85 million. Co-led by UNICEF and WHO, the Global Breastfeeding Collective is calling on countries to increase funding to raise breastfeeding rates from birth through two years of age; enact paid family leave and workplace breastfeeding policies, building on the UN International Labour Organization's maternity protection guidelines as a minimum requirement; improve access to skilled breastfeeding counselling as part of comprehensive breastfeeding policies and programmes in health facilities; and strengthen links between health facilities and communities, and encourage community networks that protect, promote, and support breastfeeding. Both UN agencies emphasize that breastfeeding is critical to achieve many of the Sustainable Development Goals (SDGs), asserting that it improves nutrition, SDG 2; prevents child mortality and decreases the risk of non-communicable diseases, SDG 3; and supports cognitive development and education, SDG 4. Breastfeeding is also an enabler to ending poverty, promoting economic growth and reducing inequalities. 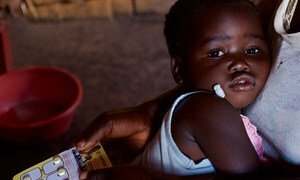 Investing in the health and survival of the most deprived children and communities provides more value for money than investing in less deprived groups, saving almost twice as many lives for every $1 million spent, according to a new study by the United Nations Children's Fund (UNICEF).